So as time goes on products hit the market and it takes a while to filter down to everyone... Here at Pixies Poultry & Pigs LLC we do not know everything (unless arguing with Pixie in which case just assume she does....). Recently we shipped from here in Florida to California, double boxed as always but there was damage and not every egg made it safely. Thats when one of our awesome customers shared with us about these pouches. Coming in various sizes, they are already heat sealed on 3 sides allowing for the egg to be placed inside rolled up and then sealed!! This way should any eggs get damaged it doesn't cause any cross contamination going to the other eggs. Coming from a company called The Boxery you can order these in various sizes and also different quantity amounts. Ours came courtesy of a purchase through online retailer Amazon and they arrived quickly in two rather large boxes. In test shipments so far we have found we can safely get 19 Silkie hatching eggs into a Medium Flat Rate Box and then double pack that into a Large Flat rate box for shipping. We are currently also investigating the USPS Regional Flat Rate Boxes but are yet to successfully find a way to be able to double box with those. Here we have shown a sample of the pouches and also just one of The Boxery's Amazon listings. Its been a rather exciting time at the farm recently. Following on from 2017 we made the decision to start shipping a small number of hatching eggs to 'test the waters' and see how things go. That has largely been a success, with only 1 damaged shipment so far. That damage did lead to us changing how we packed our eggs and with thanks to another poultry keeper we are now using 'pouches' that have been sourced through an online retailer. These have been received with a 100% success rate so far. They have meant that we had to limit our number of 'extras' as the pouches take up more room, but we work on the theory or quality over quantity when it comes to breeding success. One of the many things that has improved with time is the legally required VS9-3 NPIP paperwork and as you can see from below we have been printing these ahead of time as well as emailing them off to customers, usually the same day that the order is received. We have also started sending out a small survey/feedback form to customers who order from us, usually around 3 weeks after the order was sent. Hopefully these start coming back in soon, that way we can keep our reviews page up to date with all the feedback, good or bad, on this page. 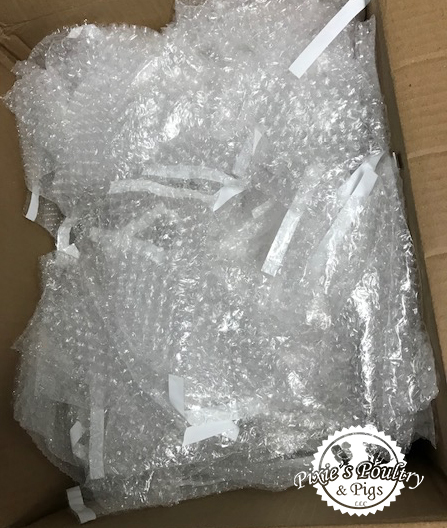 When shipping hatching eggs many things can happen over the course of one shipment but we are hoping that this feedback form allows us to eradicate any reoccurring problems as time progresses. VS9-3 and Feedback forms all ready to go out in the mail. We store all our eggs in automatic turners for up to 7-10 days so that we are incubating on a regular rotation. Our eggs are stored depending on which pen they came from so that we can keep full records. Jonathan got fed up of hand turning them each day so we invested in enough automatic turners to save a lot of time. We only use cabinet incubators. 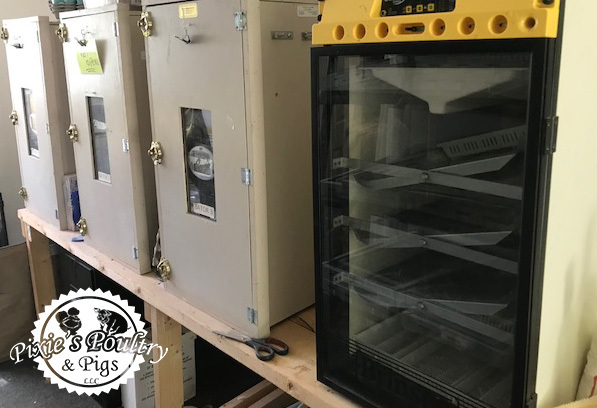 Generally we use the Dickey incubators and have had no issue with them. They are extremely cost effective at around $600 each in comparison to the Brinsea. GQF is the brand of hatcher that we use. We have four of these set up. Each hatcher is only specified for use with certain pens of birds - therefore we never have to worry about mixing different colors that hatch very similar. 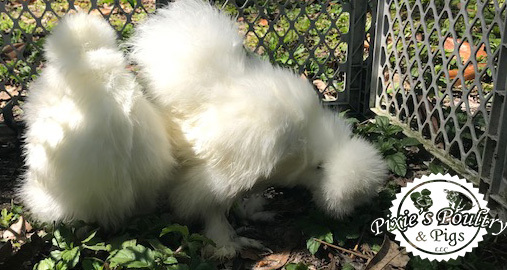 When growing out our silkies, we always look to the birds safety and well being. That does mean our areas are all fully enclosed. While some prefer to free range - we just don't like it when predators come swooping down. Thankfully we didn't lose all of our Mottled Silkies in 2017 and the project color is slowly taking shape here at Pixie's Poultry & Pigs LLC. We have been working heavily on both eye color and also feet color. Here is the latest of our chicks from stage 3 (F3) of our project working towards Mottled Silkies. Our original birds came from Aarron Hunsinger and we have added in some of our own line to help improve on them. More pictures will come of our Mottled Silkie projects as we go through 2018. How do you travel to a poultry show? One of the most common questions we get is asking how do you safely take so many birds to and from a show so far away from home? Well here is how we answer that... In 2017 we purchased a fully enclosed trailer, with AC and heat options added as well. Within the trailer we have 40 bantam show cages, that can have food and water throughout the journey to and from the show. We also have chairs, storage areas and the option to take the dogs with us too! Farm days are always interesting. You never know what will happen or what disaster you will be walking in on each morning. Following on from Irma we thought we had lost all the trees we were going to... However this 'huge' tree was down blocking the pathway to the Llama's and Bees when arriving at the farm yesterday. Thankfully being a small tree this one will be very easy to move out of the way. Its certainly a lot easier to hand than all the others. Being a business the costs of dealing with trash in our area are much more expensive, sadly you have to have a larger dumpster and the cost of around $160 a month just isn't a good idea. With that in mind we choose to take our trash to the dump instead. Which is a much more entertaining idea and certainly more cost effective. With this in mind Jonathan spent today sectioning off an area for them to be alone together at the farm. They were previously in with our herd of cows as well. So we have sectioned them into a nice quiet are for them at the farm. With 2018 being a new year, new start and very much some new beginnings we decided that why not have some new honey jars!!! Our honey comes in 12oz jars, bottled, labeled and complete with its very own bow and bee charm and can be purchased for $8 each locally. We are currently investigating some different ribbons and charms to set up 3/4 different 'designs' - would you collect them all? Who truly is the Queen Bee? So in 2017 we embarked on a new project. Jonathan has always wanted bees and Courtney didn't object so... we got bees! Starting off with just the one hive it was exciting to watch the activity at different times of the year. While it hadn't been a full year we took the decision to harvest from the hives to get some 'instant' reward. It was an extremely rewarding experience. Nature can be such a weird and wonderful concept. When you work with animals so many things can go wrong, so many untold and unknown issues can clog up any and all hard work. With that being said, the rewards when it goes right are exceptional and make the upset, tears and handwork totally worth it! The build up to Hurricane Irma back in September 2017 was one of very mixed emotions. The path of the storm kept changing and after going from completely safe for us the path changed when it was too late for us to evacuate all the animals from the farm. So there we were moving as many chickens as possible into our home. Tough decisions had to be made and we ended up with a little over 500 birds moved to safety inside the house. After the storm had passed it took two days to have any power, and then when we tried to get back to the farm we were prevented from doing so by the police due to safety concerns. Once we finally got back onto the farm things were starting to look good. Just a couple of downed trees at the top of the farm. The walk down the farm was looking good until we turned the corner and saw what used to be around 30 areas of birds with multiple trees down destroying the area, all buildings, fencing, roofing and more. We found numerous birds busy obtaining lunch for themselves. When all was said and done we had lost some 100% of the complete blood lines for some of our Ameraucanas and Silkies. We also lost many juveniles, chicks and everything that was in our cabinet incubators and hatchers. The generators only lasted so long and with the farm being at the end of a road, it was some 13 days before we had power again. Despite the energy company promising it to happen much sooner. 2018 is going to be a huge rebuilding year and with that in mind we will be selling much less than usual. We have already sold out of Silkie hatching eggs for the start of 2018. We are hoping that as the year progresses we will be able to release more eggs, chicks and juveniles. Having your very own egg eater problem with a silkie? You can purchase your own quail coop here. Spring time is on the way! Following on from Hurricane Irma in September 2017 we have had a long road back to where we are today. One of the main countdowns has been regarding when we can actually start rebuilding our stock levels. For that we need eggs, chicks and adults. With many adult birds already sold out prior to our recovery operation we will be focusing our efforts on working with eggs and chicks in 2018. We will be looking at purchasing from some of the top breeders so that e can establish a method of recovery to get back to the position we was in prior to the storm. We are excited to share some of the eggs collected a few days ago. The color on our Ameraucanas has been something we have spent time working with, and continue to do so. We currently breed Black and Silver of approved colors. Chocolate and Mottled are colors we will be working on through 2017 with the hope to be able to release them later this year. Worried about your shipment? Not with new look tracking! With thanks to the USPS tracking system and our own website we are now offering one of the most up to date visual methods of tracking your eggs, chicks or birds as they make their way to you. 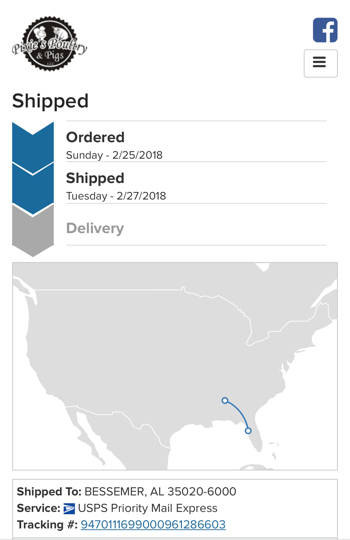 From here in Brooksville, FL to your door, you will be able to visually watch your parcel move across the USA. We send out an email with your tracking number, that allows you to track your shipment all the time the parcel is in USPS's hands. One of the main things we have been trying to work on over the winter time has been our branding. Coming up with a distinct look that stands out at shows, fairs, and even online. We chose to go back to basics and purely look at using black and white with our products. Over the coming months we will be working hard to ensure our customer service stands out above the rest. Some of the things we have been working on include clothing, laptop bag as well as thank you cards, post shipping support and more! Watch out for our news over the coming days, weeks and months as we strive to take every possible step forward to ensure your confidence and our quality.